The first flight of the prototype Me 321 V1 took place on 25 February 1941, towed into the air by a Ju 90. It was piloted by Messerschmitt test pilot Karl Baur, and carried 3 tonnes (3 tons) of ballast. 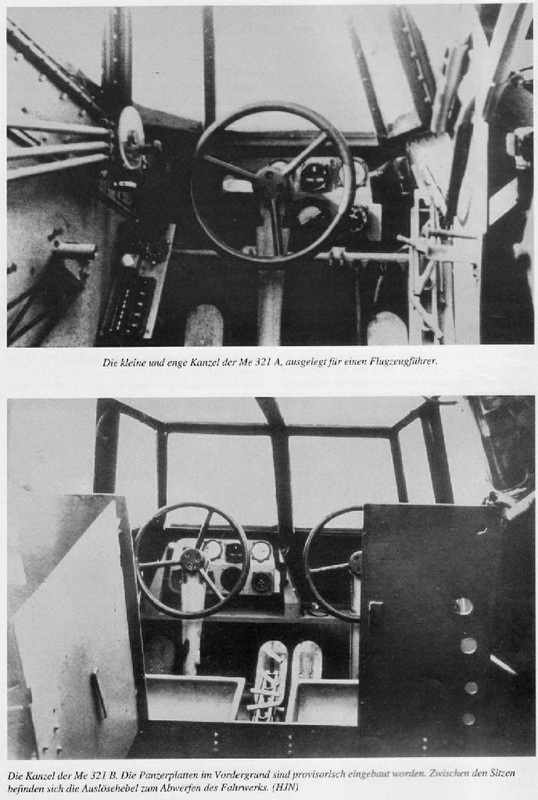 Baur reported that the controls were heavy and responses sluggish and it was decided to enlarge the cockpit to accommodate a co-pilot and radio operator and dual controls were fitted. Electric servo motors were also fitted to assist in moving the huge trailing edge flaps and further tests caused a braking parachute to also be added. If you wanted to fly a Me 321 you first had to master this ‘beauty’!? When the Junkers Ju 322 was a total failure, the huge transport glider Messerschmitt 321 went into production. The Me 321 was originally conceived to be used in the invasion of Great Britain (Operation Sea Lion) in the summer of 1940, to ferry troops and supplies across the English Channel. The huge glider had a conventional layout with high-set wings (braced by struts to the fuselage), single fin and rudder, and a “rough country,” sturdy, fixed, ten-wheel undercarriage. It had a length of 28.2 m (92 ft 4 in), a wingspan of 55.2 m (181 ft), and a height of 10.15 m (33 ft 3.5 in). Operated by a crew of two (five when armed with defensive machine guns), its cavernous interior could carry up to 120 combat-equipped troops, or a similar freight load of about 22 metric tons (22,000 kg—48,500 lbs), three times the lift capacity of the transport trimotor Junkers Ju 52. Besides, its large, swinging, clam-shell front door placed in the nose made loading and unloading easy. To make the Me 321 fit for cheap mass production, it had been designed with a fabric-covered steel-tube framing instead of a conventional light-alloy monocoque structure; it took about 14,000 hours to build it. In spite of this, the Me 321 was well constructed, and able to withstand the rigors of operations in all climates and on all types of terrain. 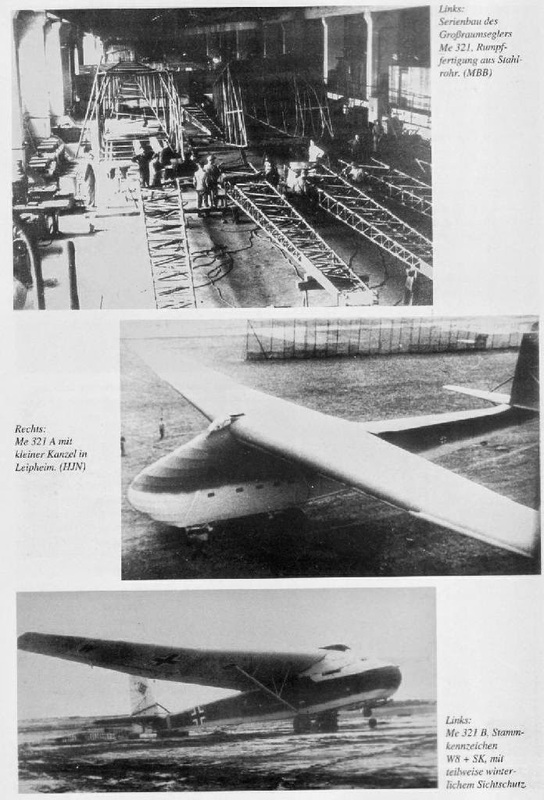 The huge glider made its first flight in March 1941, and entered service in May of the same year. 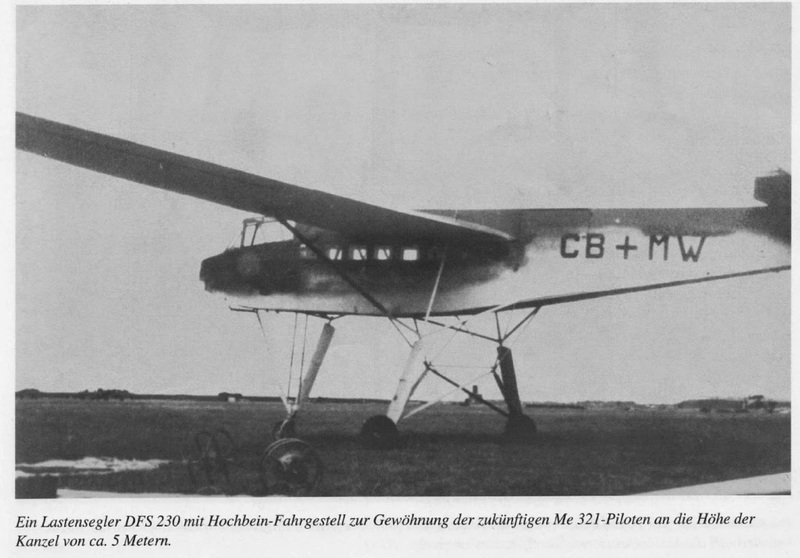 The primitive Messerschmitt Me 321 had severe limitations as a glider. It was very difficult to fly but nevertheless proved quite capable of lifting the design payload. It was so huge and heavy that a special tug arrangement was provided, consisting of either a Troika Schlepp (three Messerschmitt Bf 110 craft), or two towing Junkers Ju 52, or one Heinkel He 111 Z (Zwilling). A total of 175 glider Me 321 craft were produced. The powered version of this glider was known as Messerschmitt Me 323 Giant.